We currently have a form which uses the save for later function. As per your tutorials, we have an initial form which collects the name and email (which formulates the unique link to return to the form later). We then have the main form which uses page breaks to save the data as it is filled in - this seems to work fine. The problem we have is, once the form has been submitted and then the user would like to fill the same form in again (starting from scratch via the initial form), it remembers all the old information as if it is stored in thier cookies/cache. Additional information: We are using the 'unique submission' feature of 'loose check' which uses the cookies - could this be affecting it or not? We actually don't want to use this any more so can be disabled if necessary. Can you advise how we would keep using the 'save for later feature' but stop the form being 'auto-filled' if a user would like to fill the same form in again. (We don't really want to tell a user to clear the cookies cache if this would be a solution). The save and continue later feature does not require it to work - this is because data is saved when the next button in clicked. Hi - Thanks for your help. That has solved the issue in regards to the information being there when you go back in to fill the for in again. 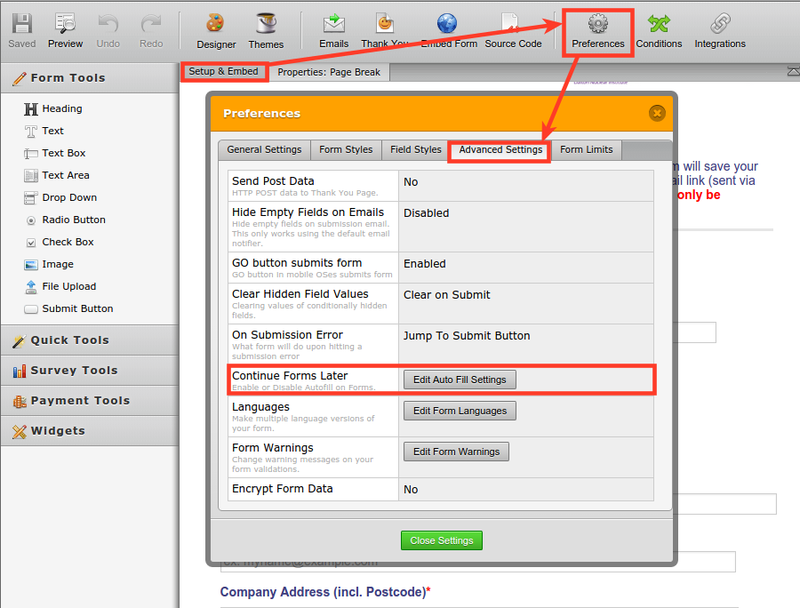 But the unique link which is sent as part of the save and continue later feature, does not populate the form with any saved data? Could you give us the process flow of how your forms works? What forms you are using. Also, if you could give us a sample session link that you have, that would also help us. Have you tried making a test submission?